Dark green indicates states whose voters have already approved legalizing recreational marijuana: Colorado, Washington state, Alaska, Oregon and Washington D.C. 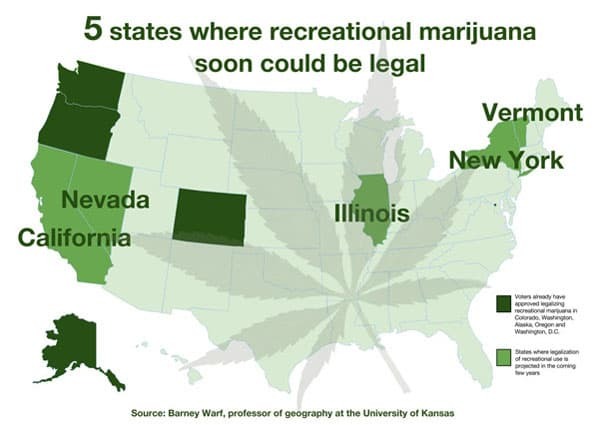 Lighter green indicates states where legalization of recreational use is projected in the coming years. With laws going into effect last week that legalized recreational marijuana in both Alaska and Washington, D.C., a researcher into the history of cannabis’ acceptance has predicted the next five U.S. states where voters could be inclined to approve marijuana use for relaxation and enjoyment. Barney Warf, professor of geography at the University of Kansas, is the author of “High Points: An Historical Geography of Cannabis,” published in the peer-reviewed journal Geographical Review. Warf said legalization can be “hard to predict,” but on March 3 he forecast the states he expects to legalize cannabis next, based on their current laws and voter leanings.